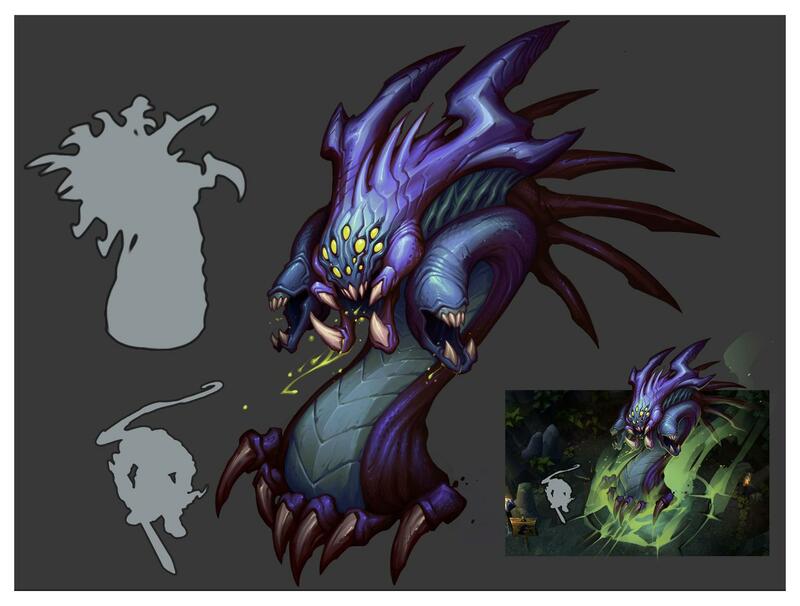 This morning's red post collection includes a heads up on the Champion Mastery Q&A scheduled for later today, a look at a TON of Summoner's Rift concept art, the 5.5 Patch Rundown, confirmation the April Fools skins currently on the PBE are NOT legacy, notes on a few 5.5 bugs, and much more! On Friday March 13th, the team behind the newly announced Champion Mastery system will be hitting the boards to host a Q&A on the upcoming feature! "The team behind Champion Mastery is preparing to host a Q&A session at 1 PM PDT on 3/13! Come along if you have questions about the system’s creation, features, or future! 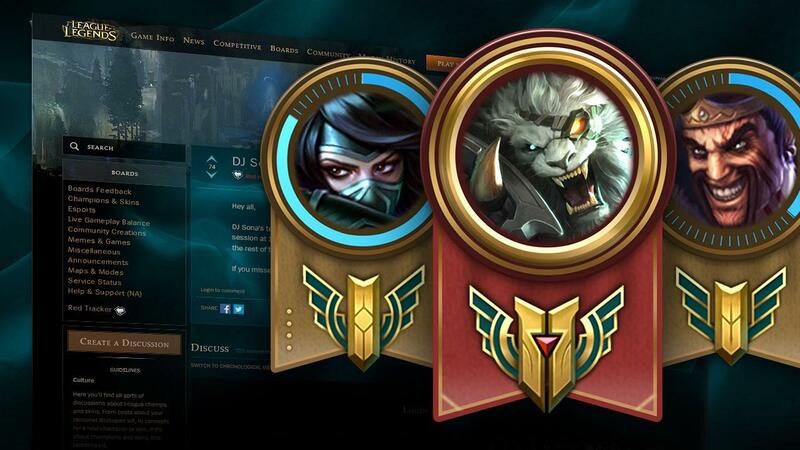 Learn more about Champion Mastery here." With patch 5.5 out on live, Scarizard and company are back with another patch rundown video! "Join Scarizard, Riot Jag and Jatt as they discuss today’s patch, focusing on changes to the jungle, Kassadin, and Veigar." Riot KateyKhaos confirmed on the boards that the five "April Fools" skins on the PBE - Surprise Party Amumu, Urf the Nami-tee, Archduke Nasus, Order of the Banana Soraka, and Definitely Not Udyr - are NOT legacy skins. "They're not legacy, so they'll be sticking around. :D"
Check out our PBE coverage for a better look at these upcoming skins! "Thanks for the report, video in particular's really helpful for bugs like this. Looks like there's an issue where the original CD will override the intended reduced CD. Not seeing a pattern to why yet, suspect it's a race condition in code, should be pretty simple to avoid though. For anyone confused about the intended functionality what should happen is that the Q's CD after the arrow fires should be reduced by the amount of time the Q was charged for. E.g. Assuming a base CD of 8s at max rank Q should go on a 6s CD if the arrow's held for 2s, 4s CD if the arrows held for 4s, 8s CD if the arrow's snap cast immediately etc. The bug here is that sometimes the 8s CD's being applied regardless of how long the arrow was held." Video of the bug available here. "Looks like this is just a tooltip bug. Deathcap's still giving the bonus AP, but the bonus listed when you mouseover its icon stays at 0." Hey everyone, thanks for the Windows 10 crash reports. As a lot of you have pointed out, we don't support Windows 10 yet so your mileage may vary as we work toward full compatibility. That said, MMACheerpuppy hit the nail on the head - we still want to do what we can to help those of you who've opted into the preview. Speaking concretely, we're currently looking into a few leads from the log information that's been provided (animation and/or sound files appear to be the culprit at this point). No promises on timeline but we're hoping to get something out before the next patch. Once we get some additional updates, we will make sure to update this thread! In the meantime, if you have the capability to run your computers off of Windows 7/8, make sure to do so in order to update League and play normally." "Your facts are correct - Win10 is in preview and LoL was working fine with it, but we've run into an issue with 5.5 and we do need to fix this problem before the new OS goes into production. As you've mentioned, the point of the preview for developers is to give us the ability to adapt our game - and our engineers - to the new OS. We're in the midst of that process now. I hope I didn't come across as dismissive when I mentioned we don't yet support Windows 10. You've been pretty active in this thread so I think you've seen that the community has a wideranging understanding of what an OS preview/beta experience can be like. The reason I brought that up was that to most people, "we don't support it yet" is probably enough of an answer (both because most people aren't on Win10 yet and because most people aren't interested in compatibility discussions). We DO care that this is happening to players and we DON'T want to leave you shipwrecked indefinitely while we keep working under-the-hood to become Win10-ready. We've actively focused resources into this new crash issue throughout the day and we'll get a fix out as soon as we can. I'm sorry that I can't give you a timeline for resolution, but we are DEFINITELY not ignoring this." With Bard's release, Ziggs' price has been reduced to 4800 IP or 880 RP! Check out more information on the permanent champion price reduction schedule here. 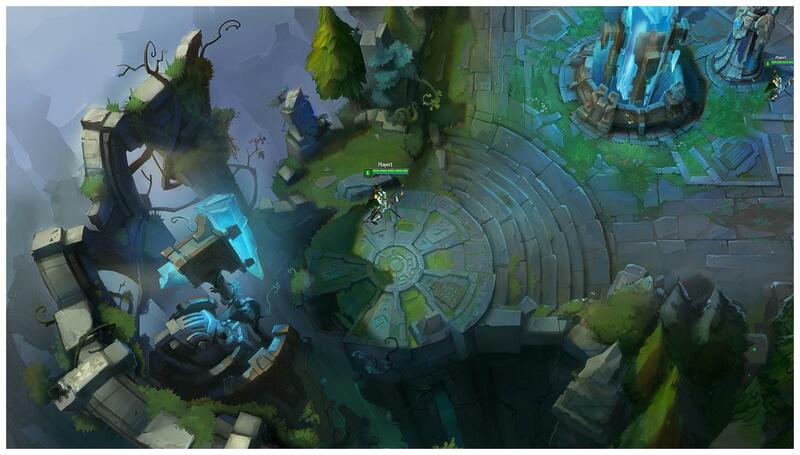 "Summoner’s Rift has come a long way since League’s launch in 2009, but our latest update to ol’ trusty was the biggest change in the map’s history. 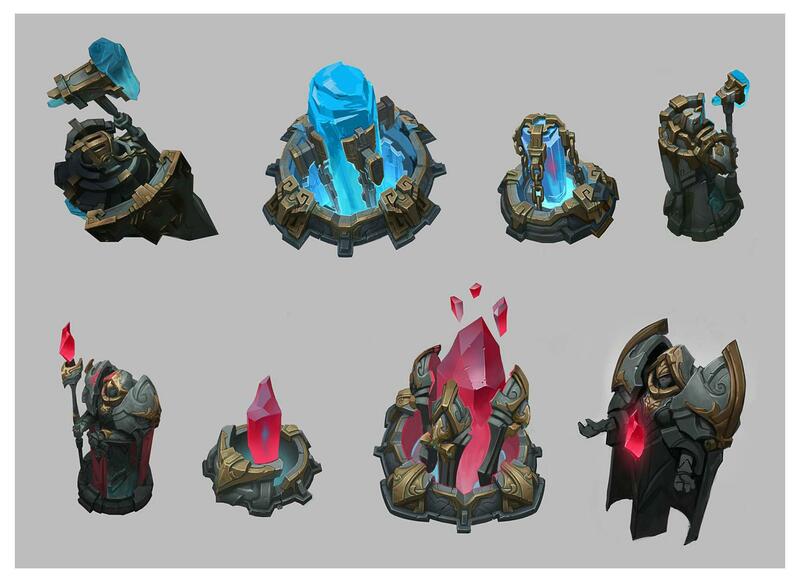 While all updates go through iterations and testing, Summoner’s Rift required a huge team of artists to concept and sketch out art for months before we started working in 3D. 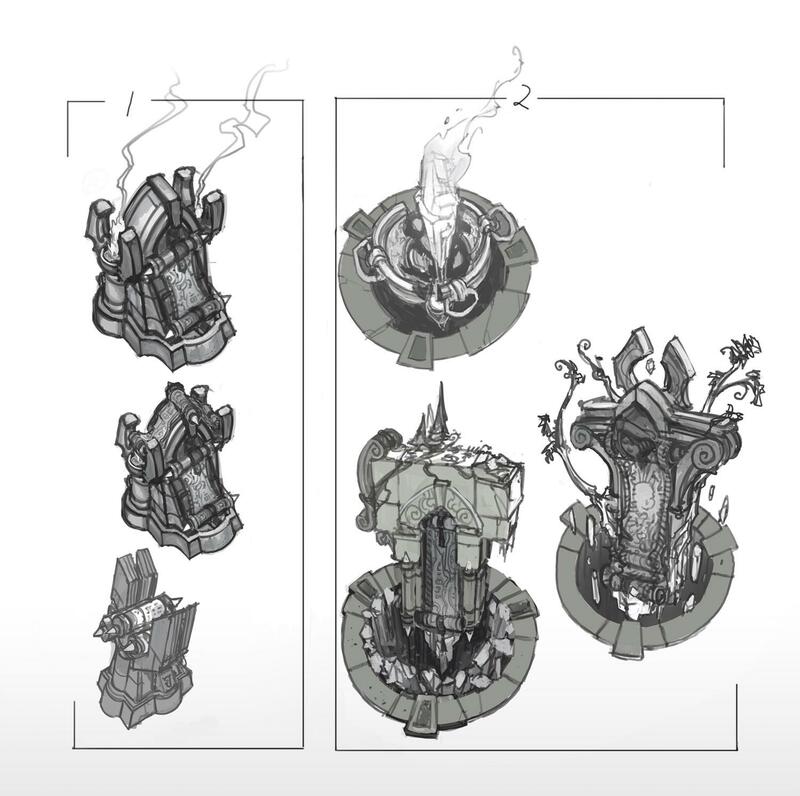 To celebrate the end of SR’s beta run, we’re releasing a few of the concept art pieces the environment team created, complete with notes and insights from the artists themselves. Here’s a super late painting we created to hone in on the spawn area’s lighting. 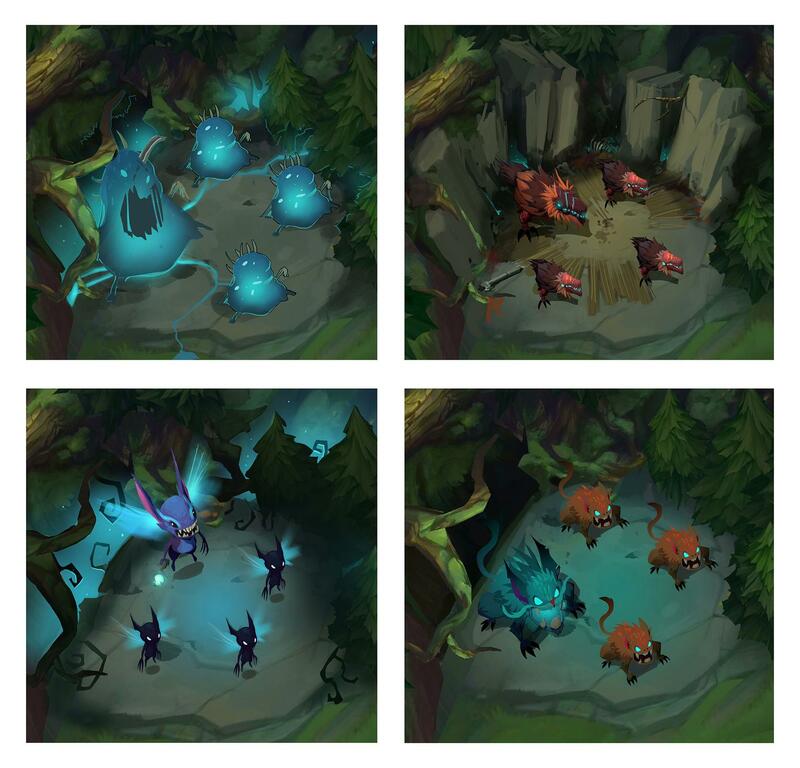 The beta launch of Summoner’s Rift actually had zero lighting, but we slowly added elements in as we updated the map. 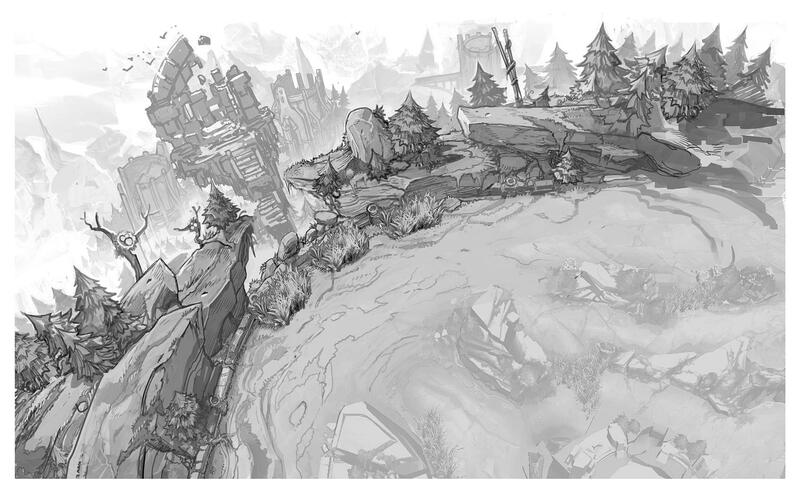 We painted this up to study how we could show terrain transitioning from areas near Baron to places way away from him. 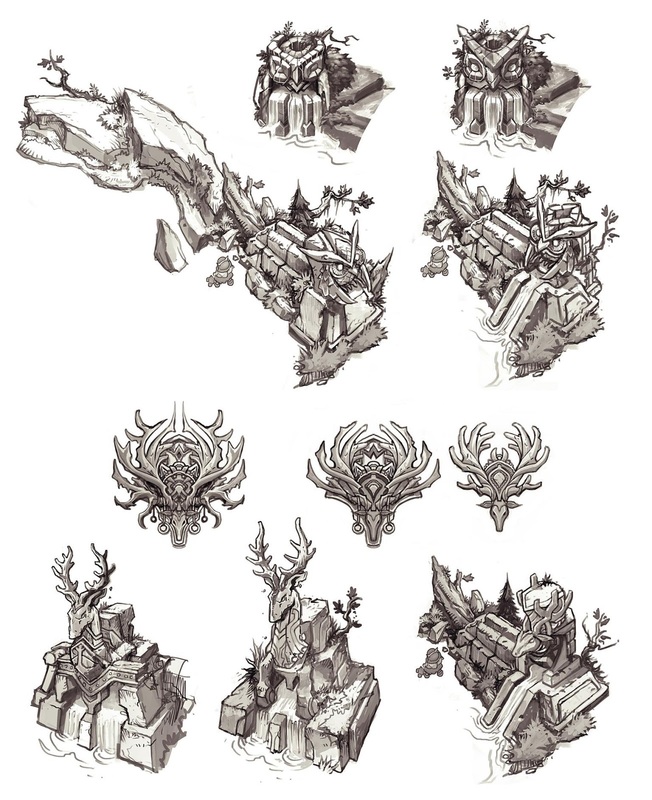 These are some concepts that we sketched out for an asset to replace the small cluster of trees in the original SR bases. We wanted to replace that blocker (the term we use for something you can’t move through) with something a little more visually interesting and architectural. Old baron was... well... a bit of a sock puppet. After trying a few ideas out, we ended up using the model that would later be in A Twist of Fate. But we still iterated, making tweaks to his head area, and giving him a huge body that we could really show off in his spawn animation. These are a couple of early studies looking at the composition of the north spawning platform and shop. The first is earlier, and from it we refined shape language, values, how busy the area would be, and overall composition. 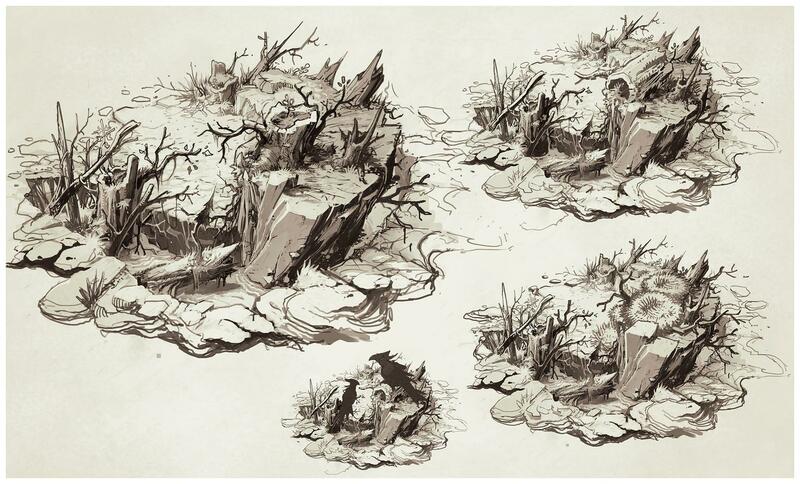 These are super early sketches of the northern area, which we wanted to feel more destroyed than the rest of the map to emphasize Baron's catastrophic impact. These drawings pushed really far in that direction. We used a sharp shape motif for the Paladin (or south side of the map) that would stand in contrast to the Mages (North side). The Paladin elements in the map are strong squared shapes and motifs that stand out from the sharp, aggressive, and dynamic shapes used by the north side. These are some explorations looking at how the rift would infuse one of the more natural creatures on this mountain. Back on Howling abyss we designed one of the shopkeepers to have this massive pack-yak. We really loved the idea but we could not get him to work within the constraints of the Freljord. 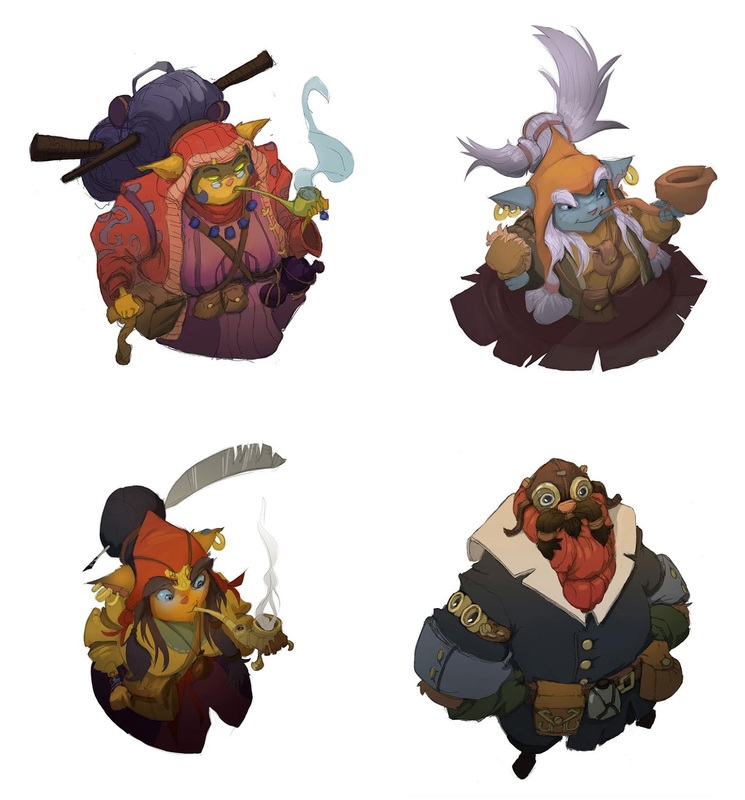 He eventually became a she, and fit perfectly into SR. We always knew that we wanted some type of shipwrecked balloon-riding yordle for the north shopkeeper. We knew really early on that wraiths didn't feel indigenous to the rift, but it took a really long time to find a critter that would fill his shoes. 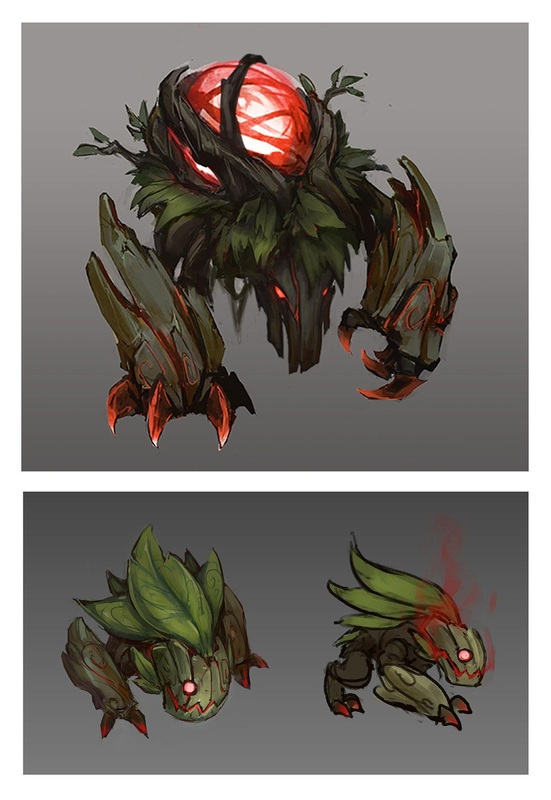 The team really resonated with the idea that the magic of the rift physically forming into its guardians, and the Brambleback in particular to reflect the raw aggression that you feel when you pick up the red buff. 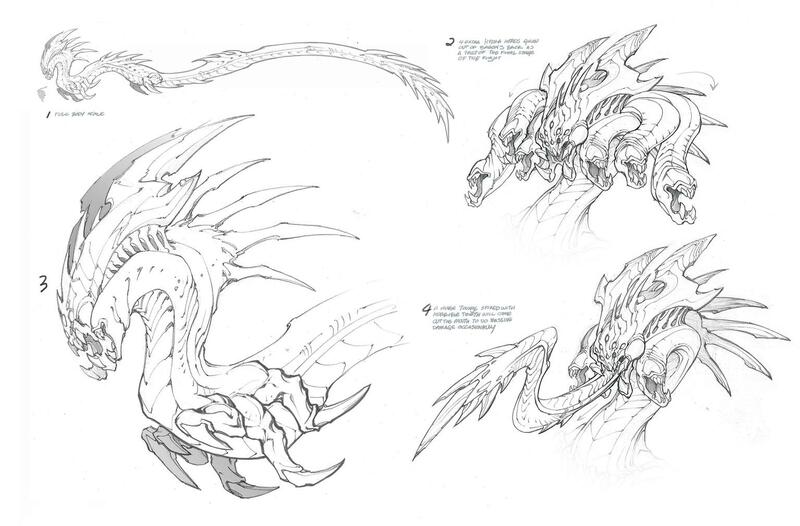 There was a lot of focus on how we wanted a unique dragon from other IPs and fantasy games. We tried a grounded dragon, but ended up with a thick, heavily armored guy, so carried on until we gravitated around this study, which put us on the path to finding the unique League take of a dragon. We spoke about quadrants during the map update's beta stint, but here's a really clear representation of what we wanted to pull off. It's a really early painting, but even still you can see the redwoods in the north, the cairn-stones in the east, and the overgrowth and vines in the south. We ended up going with a different direction in the west jungle, but its color palate and tone is still pretty similar. This concept shows the contrast between the paladins and mages use of magic. In the case of the Paladins, magic is used in a very tightly restrained and controlled way; In the case of the Mages, magic is used in a more organic and chaotic way. This hearkens back to the old map and the Order vs. Chaos sides. 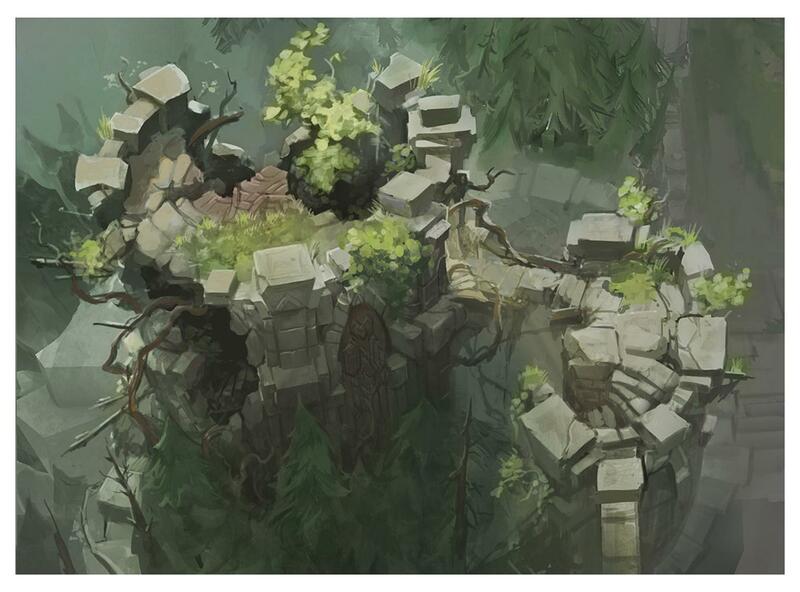 In this top lane vista sketch, we wanted to explore rock shapes and study the integration of the background elements. This is a more wild version of the area that you see in SR now... and has a lot of eggs. 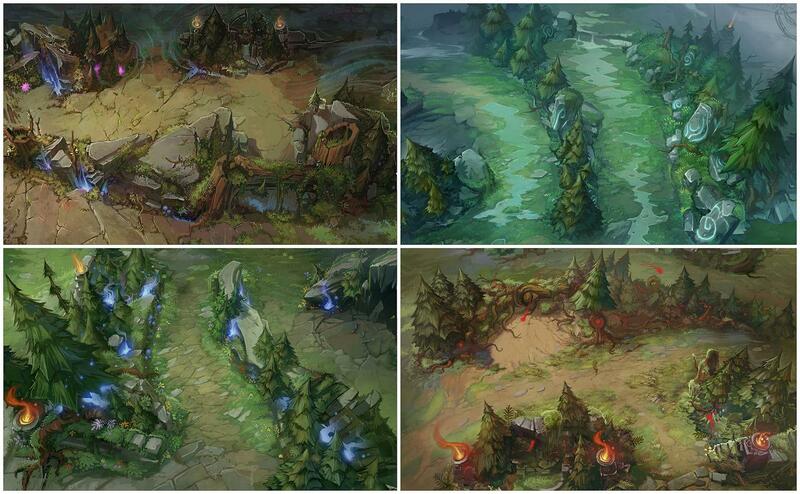 Here's an exploration of the architecture we had out in the periphery of Summoner's Rift. We really wanted to use this blocked off space to show structures that the native cultures built, hopefully giving you guys a sense of a consistent and cohesive world. Our early minion concepts explored ideas like minions made out of animated magic scrolls, bolts of cloth animated by magic, and even just sound. This was actually a very late exploration of Dragon. 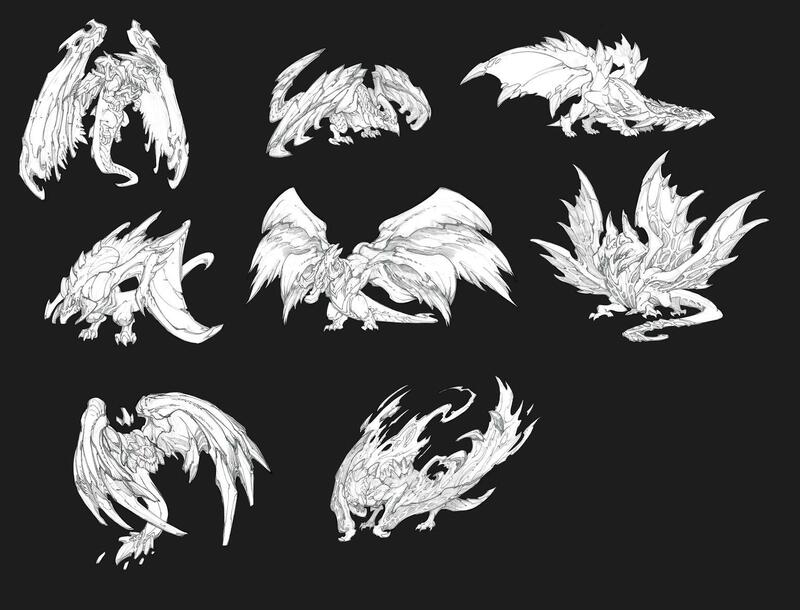 Many of our earliest ideas for Dragon were not even dragons at all, but ran the creature gamut of what could fill that role on the map before we decided to go back to a more traditional scales and wings creature. 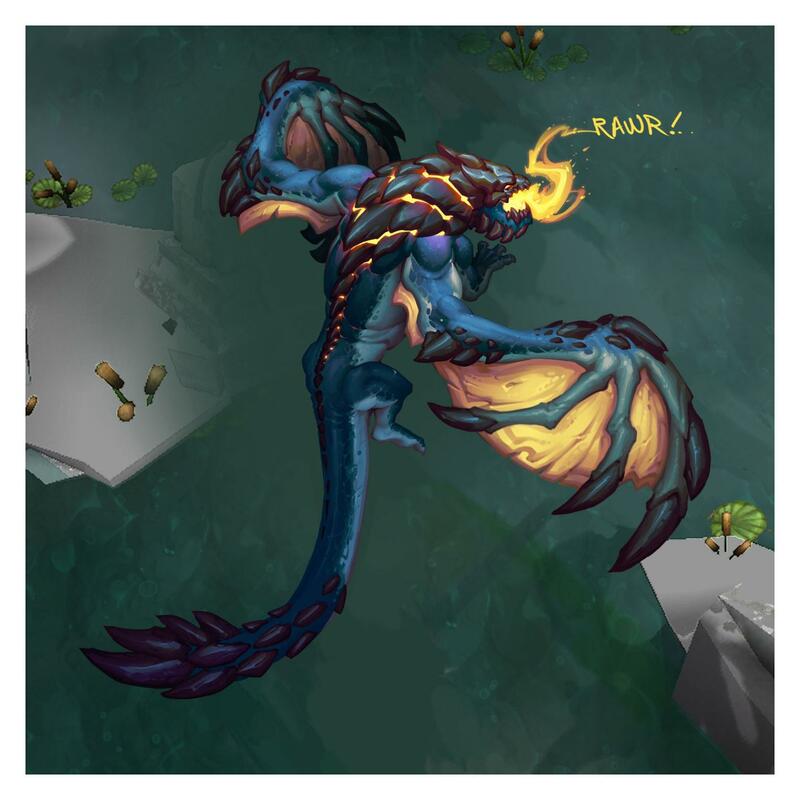 The dragon we have in-game is a combination of the proportions of the first dragon, the head and wings of the third dragon, and the tail of the seventh guy! This Baron illustration was one of the first images that was created for SR. We heavily referenced him for all of production. The way he is constructed (using stylized but very aggressive shapes) guided how we created everything from creatures to rocks to trees from that point on. This concept was an attempt to apply a very heavy and distinct theme on a specific quadrant of the map. The cracks show that you're near Baron, and we created giant trees that were ripped down when Baron spawned, with tons of new life grown back since. We explored two opposing animal types as the potential themes for the different sides of the map. Here are some early sketches!" "The concepts are usually done before we make 3d in game models. Sometimes we make an awesome mind blowing concept, but it does not work in the game. Examples: The design is hard to click on. Or it does not fit the environment, Or it does not look like tanky enough? or look weak enough? The creatures have to look, in relation to each other, at the correct power level or defensive power level. 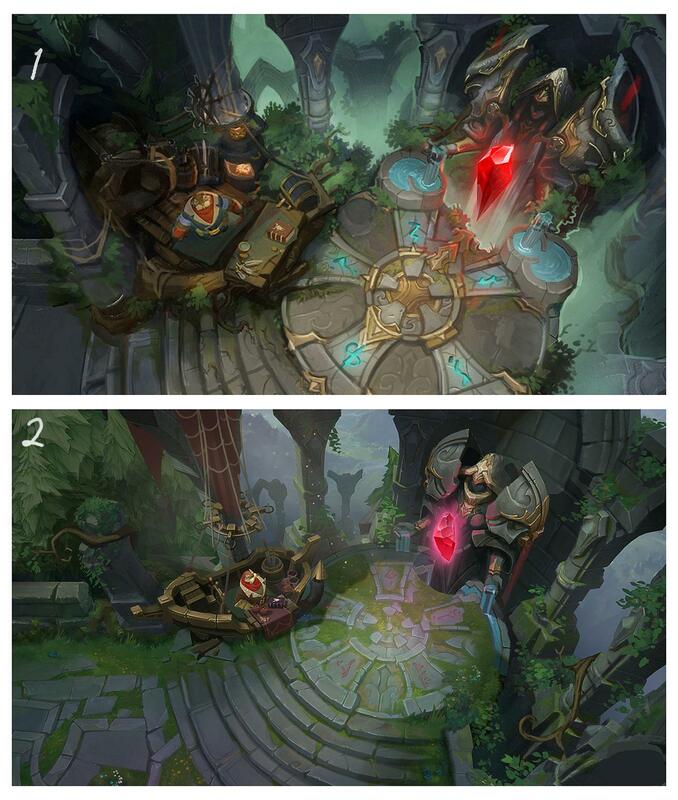 An environment piece has to be cool but not distracting to champions or effects. All the concept work here is about trying to answer those questions. Does it work with gameplay? Does it fit the big picture? Art serves gameplay. I hope this answers your question. 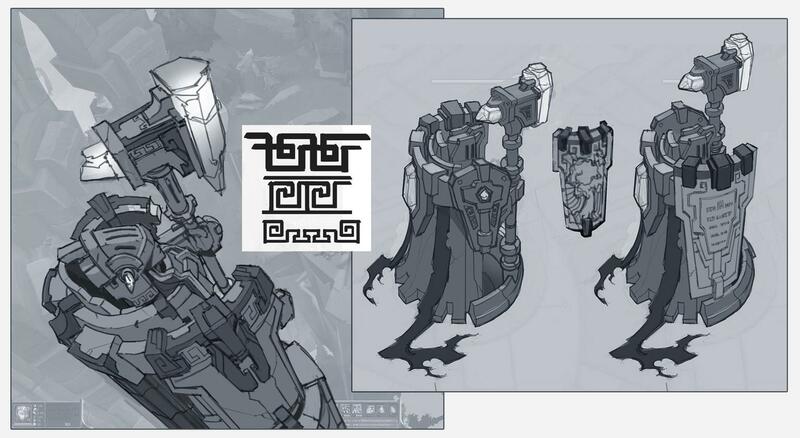 GG"
At one point during this concept we had at least 5 ashes copy and pasted on this concept. The reason for that was to help with scale. When we paint details next to a champ it helps with figuring how big to make things. How big should a pebble be? how big should a brick be? or a tree? or a grass blade? that sense of scale has always been a challenge since SR and dominion, We are getting better at it. :)"